In part one of this two-part article, I focused on the aspects that contribute to the balance of Netrunner, as well as the current issues with that balance. In part 2, I will try to propose some solutions to the the question ‘How do you alter the balance of Netrunner to be something healthier?’ In finding solutions, one can look at balance through the design of cards, largely hate cards which are specifically designed to counteract a specific strategy. Alternatively, one can look at possible changes to the MWL or the various existing tournament regulations, or even at Bans, Errata and Restrictions of the card pool. As I talked about in part one, balancing an asymmetric card game is challenging because you need to achieve both balance between each side and within each side. In a symmetrical card game, when one deck is too strong you simply need to target pieces of the strategy with bans or design hate cards against it. However, when fixing balance in Netrunner you both need to consider whether the deck you’re hitting is on the stronger side or the weaker side. Making a deck weaker makes that faction weaker as well as that side. One must consider both of these when making balance decisions. Although Faction Balance has improved markedly since Worlds, Side Balance has deteriorated. In the Worlds 2016 meta there was Side (Runner vs. Corp) Balance but Faction (Anarch / NBN dominated) imbalance. This was largely due to CTM being the only Corporation deck that did not have strong counters available yet, and so the decks that were not good against it on the Runner side were largely pushed out of the meta. Since then, various hate cards have been printed that challenge CTM’s dominance, but other Corp win cons have not become stronger. This has meant that while we moved from a more between faction balanced game (HB and NBN, Criminal and Anarch), the two sides of the game has become more imbalanced (with currently Runner being way stronger). What is a Hate Card? The first tool that helps achieve balance is the hate card. A hate card is a card that directly targets a specific card or tactic of the other side. A hate card is said to be narrow if it only hits a couple of cards or strategies, and a hate card is broad if it hits a wide range of cards or strategies. You can also think of things like Jackson as soft hate cards, because in specific matchups (e.g. DLR milling strategies) they do a lot of work, while also providing useful functionality in all other games (just not as strong). One of the big things I’ve talked about in this series is how much of Corp power is based around win conditions, and how there is a tendency of Runner hate cards to target these sorts of cards. This can be extremely dangerous, if the Runner can play one card to remove one win condition card on the Corp side, they usually end up way ahead. Additionally, often if you remove the win conditions from a Corp deck it ends up barely functioning, because of the fact that in a game of Netrunner between Money / Ice / Icebreakers, the Runner is the stronger side. This is what has happened now, where in the quest to provide answers to the strongest Corp cards all the Corp decks have been become extremely weak, ignoring that these cards being strong is necessary to have a balanced game. Before Clot came out, the best strategy against FA decks was basically to maximize your accesses because you ultimately couldn’t stop them from scoring. There was skill in reading the Corp’s play and perfectly timing a Legwork, but ultimately whether you were Andy or Kate, you were trying to get as many accesses as you could before the Corporation won. Once Clot came out, this all changed. NEH was now forced to build remotes to score sometimes, and to bluff with SFSS and NAPDs. Using Clot would interfere with the rest of Kate’s rig, as sometimes she’d need to trash breakers in order to get an SMC for Clot out. The matchup went from fairly close to a decent Kate favorite, but the gameplay became way more interesting, which was the true success. Another hate card that I think has been successful is Astrolabe. While Astrolabe is a much softer hate card than Clot, it still acts in a similar way where it gives you much more value against certain strategies than against others. Against Asset Spam, Astrolabe can often draw you most of your deck for a 1-cost hardware, while against something like Glacier or Meat Damage kill it will only draw one-three cards over the entire course of the game. There are two things that I think are worth copying from the success of Astrolabe; first that it is always useful so it never feels like a dead card, and second that rather than negating the Corp’s strategy it gives the runner more resources to fight it. Finally, there is one hate card I think was a partial success. Political Operative (Plop) was a well designed hate card for Criminal. Criminal is very weak to defensive upgrades as it has less efficient Ice Breakers than Shaper and cannot destroy servers lowering their total cost the same way Anarch can. Plop helped Criminal with one of their worst matchups at a time when they were the worst Runner faction. Finally, in terms of counter play, Plop has limited usage, requires a successful HQ run (which is already defended against Criminals by Corps) and as a resource can be destroyed by tags. However, Plop becomes more problematic outside of faction. Against both Shaper and Anarch, Corps usually do not want to waste more than one Ice on HQ as they want to be pushing the pace in the remote and forcing runs. This means that the restriction of needing to make a run was not meaningful. Additionally, at just one influence both of these factions were able to import Plop and create decks that went from fairly even matchups to massive favorites against Glacier decks. Rather than fixing a weakness of the Criminal faction, Plop was imported to create decks that could dismantle an archetype by destroying its win condition. Plop should have been three or four influence, so Anarch and Shaper runners could only import it at an extremely high deck building cost. I’ve talked about some hate cards I think are well designed, but it’s also important to examine some hate cards that did not work. The first of these is Rumor Mill, which likely will not come as a surprise to many people. Rumor Mill has basically rendered Glacier decks completely unplayable outside of a meta call where you believe none of the Anarch decks will play even 1 Rumor Mill. The key thing to understand about Rumor Mill is to go back to the understanding that in a game with just Ice and Money on the Corp’s side, the Runner is a massive favorite. Rumor Mill basically acts to turn Glacier decks into decks with only money and Ice, and no other tricks. While it’s a current, which would make this only temporary alteration, what actually happens in practice is different. The runner waits until the Corp advances an agenda in a scoring remote, plays Rumor Mill, and then runs the remote and trashes every defensive upgrade. Even if the Corp has a current, Rumor Mill is effectively still online as the Corp’s defensive upgrades are trashed (aka blank). The only card in the game that provides effective counterplay to this play, The News Now Hour, would need to be defended, is three influence, and is effectively useless outside of this matchup. Rumor Mill is probably the most problematic hate card ever printed, because it has almost no counterplay, was printed in the best faction at the time, and hurts an archetype that was not even dominant at that point. 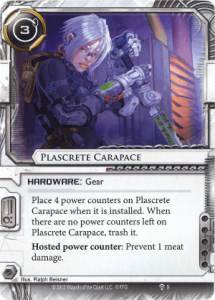 Plascrete is one of the oldest hate cards, printed in the very first datapack of Netrunner. In many ways, it was a necessary card as the runner had little means of combatting Sea Source + Scorch Earth. However, the way in which it did made it so once played the Runner was basically rendered unkillable, as in the early days it was extremely hard to land a tag outside of Sea Source that would be required for a triple scorch. Additionally, there was not any hardware hate at all at that point. It was too strong at first, as there was no counterplay to killing it and no way to kill through it. However, as the game progressed tools like Midseasons, Traffic Accident, and Boom came and gave more tools for the Corp to kill through Plascrete. It’s still not the best designed hate card, because it doesn’t really provide for much interesting counterplay (Astro+Shattered Remains was semi interesting), but ultimately where it is at in the meta currently is a reasonable power level. Moving forward I prefer the design of Sports Hopper that is less strong against kill decks but is more versatile. 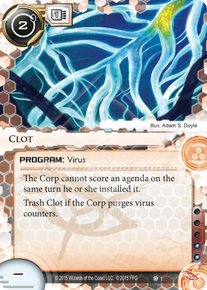 Aaron Marron, while having some of the only Netrunner art I’ve noticed, is a hate card that I think is poorly designed. As we’ve discussed, while CTM was the best deck in the game, Corp as a whole is struggling. Aaron provides extremely powerful tag avoidance ability to Crim, a faction with an already decent CTM matchup. This includes complete protection from Breaking News, a strong proactive card that allows the Corp to attack the Runner. Additionally, beyond allowing Criminal to get strong CTM matchups, Aaron is able to also counteract Net Damage and Meat Damage strategies. Against the incremental net damage Aaron is able to draw up to prevent any kill. Against meat damage, Aaron can clear the tags landed for the killing blow. This represents ⅜ of win conditions I listed early which Aaron completely counters, and even outside of that Aaron provides a ton of value in matchups he doesn’t clear tags in. Finally, unlike other resource based hate cards since Aaron can remove tags, the Corp does not have access to the standard way to kill him. Ultimately, Aaron hates too much of the field too well and provides very little counterplay due to his self protection to be healthy for the meta game. While hate cards for Corp win conditions are a dangerous design territory, there are some successes and lessons we can take away from the examples above. First off, it’s good when the hate card provides a cost (using a Clone Chip, memory, clicks, money) to use that the Runner can take advantage of elsewhere. Additionally, it should increase the level of interaction (like with Clot, where the game turns into a whole resource control fight with CVS and a bluffing game with Shipment From SanSan). It’s a good idea to make broader hate cards, but you need to make sure they are not as good vs. their hate target. Finally, meta considerations are very important when creating hate cards. Hate cards should be used to shore up a faction’s bad matchups, not used to strengthen a faction’s already good matchups. Hate cards can be a good idea, but often if a strategy is fundamentally toxic it can be a better idea to ban it rather than printing hate cards to try and push it out of the meta. The more immediate solution to meta problems are tournament rules, like the MWL. One of the things to understand about the MWL is that it doesn’t fundamentally make any single card worse, but rather that it’s a deck building restriction. No amount of MWL restrictions were going to make an un-Errata’d Wireless Net Pavilion not dumb, or make Astroscript Pilot Program anything less than completely busted. Astroscript still did the exact same thing before the MWL as after; the only thing that changed was the quality of cards you could include alongside it. There are two takeaways here, the first is that for some cards no amount of influence restrictions will bring them in line with other options, and the second is that the MWL largely does not act to restrict the power of any individual card, but instead lowers the power of decks by reducing the number of power cards that can be played in them (or preventing them from being made at all). Ultimately, this may mean some cards need bans to avoid seeing play, and some decks might need bans or errata to bring them down to a reasonable power level (no matter how many yellow cards got MWL’d, Astroscript was powerful enough that yellow was going to give up out of faction cards before it gave up Astroscript). I think it’s important to talk about bans, since Netrunner has still yet to have them. In Magic, where there is a secondary market and highly played cards are very expensive, banning cards can often be the equivalent of causing a large portion of the player base to lose hundreds of dollars. 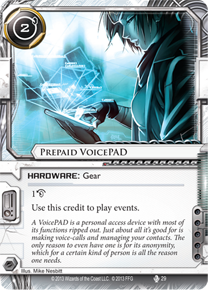 In Netrunner however, the cost would be negligible as no one has paid that much for any single card, and whatever card is now more playable because of the ban is typically already in a player’s collection. FFG should not be afraid of banning cards, and it would in fact be shocking if we had gone so far into a game’s lifespan (and a game so fresh and different) without something needing a ban at some point. I have a suggested list of changes, and I think it’s important to note that my suggested changes focus primarily on balancing the game. There are some strategies which may or may not deserve to be hit for gameplay reasons, but I’m mainly focusing on changes to restore balance between the sides and within the sides (though there is a certain amount of bias that’s happening with what kinds of decks I’m trying to bring out with these balance changes). Aaron, Rumor Mill, and Feedback Filter are listed because they make it extremely hard to lose the relevant matchups. I think Rumor Mill is obvious and a vast majority of competitive Netrunner people I talk to want it banned. Aaron is probably more surprising, but I feel he single handedly wrecks any tag based deck (both kill and scoring based) while also being extremely powerful against incremental Net Damage kill decks due to his ability to bank card draw to protect against traps. He hates too wide a section of the field far too well to have anything other than a disastrous effect on overall Corp / Runner balance given the current state of affairs. Feedback Filter has quietly been one of the strongest hate cards in Netrunner for a long time, and anyone who has tried to play PE against a Runner with a decent economy and Feedback Filter knows it’s a completely miserable affair. Most of the hardware counter play (Power Grid Overload, Shattered Remains) is simply not good enough and not widely useful enough to create any interesting sort of answer Net Damage decks can utilize. Blackmail, Faust, Şifr, and DDoS are on here because of how well they subvert Ice and strategies which rely on Ice, which are generally thought of to be a fundamental part of Netrunner. DDoS enables Dyper, which is generally considered one of the dumbest decks to play against, and outside of Dyper its primary use is to cheese potato Account Siphons turn 1. Blackmail completely subverts Ice and there are several decks now which intend to never let the Corp rez a piece of ice. 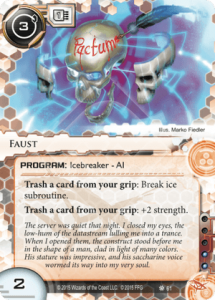 Faust is probably the most powerful breaker Netrunner has ever seen, and despite extreme nerfs in the last MWL, it still sees play and enables most of the strongest Anarch decks. Şifr is new, but its ability to destroy any Ice when combined with Parasite is broken and heavily restricts Corp options because of this. It was a mistake, just ban the thing and we can all move on with our lives. 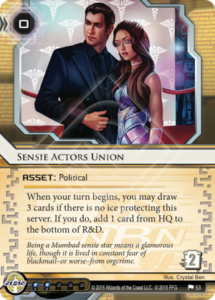 Sensie Actors Union is the only Corp card on the list, and is here because – as I talked about in the Runner balance section – it’s the biggest reason why a large swath of Runner decks cannot compete. When played in CTM, it is simply too hard for a deck to beat a turn 1 SAU, and it overly restricts Runner deck space to only decks that can deal with it turn 1. Additionally, with the weakening of Anarch due to the Faust, Blackmail, and DDOS Ban, there is the danger that Asset Spam might run amok again. SAU is a strong card in that strategy, but is ultimately not a win condition on its own and does not prevent a Corp deck from winning. SAU is the fundamental problem with CTM, and no amount of MWL will be able to keep CTM from including it (meaning the core problem will still remain no matter what influence restrictions happen). This list of cards I’d put on the MWL is fairly short. Temüjin Contract is massively above the power curve when it comes to Runner economy cards, and is clearly too strong as printed. However, I think it’s an interesting effect that encourages decks that rely on Ice to exist, and provides a solid boost to Criminal. At 3 influence it would be way harder to justify splashing it out of faction, while in Criminal (where it’s most interesting due to their inability to destroy ice) it would still be played. I think at this juncture it’s clear that some cards can come off the MWL. The cards I have listed are cards that would help boost strategies that are no longer dominant or prevalent at all. Eli has simply had more good options against it printed (Paper Clip) and the decks it was dominant in (Foodcoats, NEH) are no longer dominant. 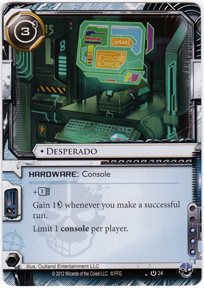 Desperado is one of the best runner cards in the game, but by putting Temüjin on and taking Desperado off you’ll leave Criminal at basically the same power level. Since Criminal does not have any other options of similar power level, putting Desperado on the MWL was doing nothing to increase in-faction diversity anyway, and Desperado’s status on the MWL should be strictly consider in terms of balancing the strength of NBN. Prepaid was the backbone of Prepaid Kate, a fairly strong deck for a long time that was never completely dominant the way Andysucker was. With Shaper falling off the map and the proliferation of assets, a strategy that Prepaid Kate had difficulty with, I feel it would be safe to take it off and would help strengthen Shaper. The primary goal of these changes is to be able to push some Corp wincons back into the game and give a variety of decks the ability to win on the Corp side. This is done largely through removing cards on the Runner side that overly limit one or more Corp win conditions, while largely leaving the Corp cards untouched. I would expect to see Caprice Jinteki Decks, Potential Unleashed, Foodcoats, CTM, SYNC, CI7, and maybe some Blue Sun or Argus. Weyland would still struggle as I feel they are still weaker, but some of the support coming in the Terminal Directive and Red Sands looks like it can make for very strong win conditions. On the Runner side, several of the strongest Anarch archetypes have been severely punished with Faust being banned, but while Temüjin Whizz is weaker, it’s still capable of being played. Criminal stays at the same power level and Shaper would see a slight boost, hopefully moving all the Runner factions in line with each other. My biggest worry with these changes is that the Anarch and overall Runner money nerfs would make Asset Spam too strong, so some preemptive MWLs on Mumbad City Hall or Friends in High Places might be warranted. However, I feel that is a result of a judgement call that pure asset spam isn’t healthy, and as such I didn’t recommend it as part of this article where I tried to mainly focus on balance. Additionally, I think if Corp ends up being too strong after this, GFI is a ubiquitous powerful card that could be banned in a meta where Corp is overly favored, but would be a disaster to ban in a Runner favored meta. 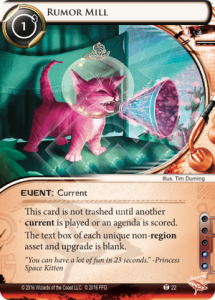 The Netrunner meta is not in its best place right now, but I think that ultimately with the right aggressive action it isn’t very far from being vibrant and healthy. It’s still at its core one of the most interesting and engaging games I’ve ever played, and I still find myself having wild games I tell my friends about. The sheer diversity of playstyles and how different everything is continually draw me back in, and I think maintaining this diversity of styles is the key to the health and success of Netrunner. I hope that what I wrote can help the short term balance changes to bring Netrunner back on track, and in the long term stimulate discussion about how to design Netrunner to take into account the asymmetry of the sides. Thanks to shanodin, clercqie, and inactivist for all the help with editing.